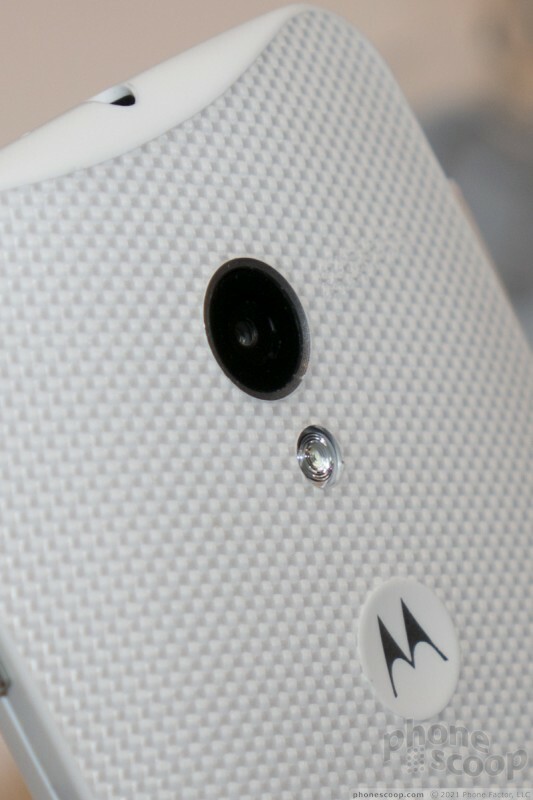 Motorola claims the new MOTO X was made just for you. It is a curious phone that offers useful new software features and some compelling hardware options. Here is Phone Scoop's first look. 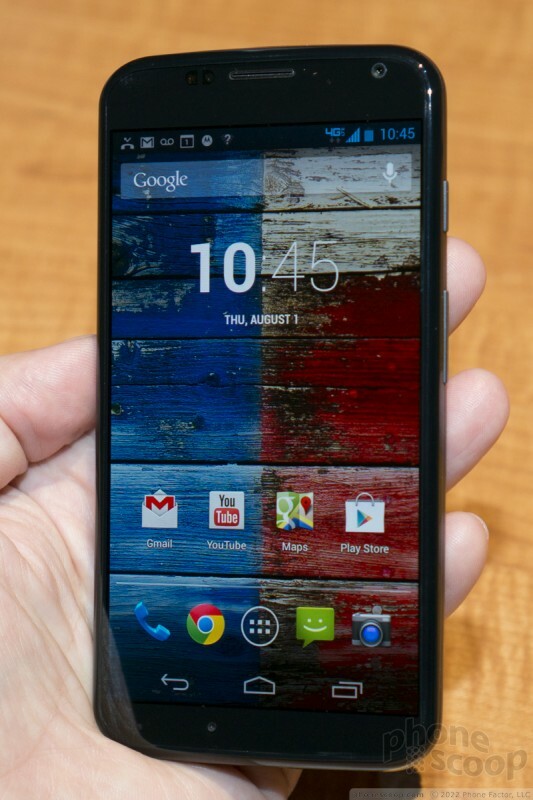 The MOTO X is the first handset built from the ground up by the combined Google-Motorola entity. 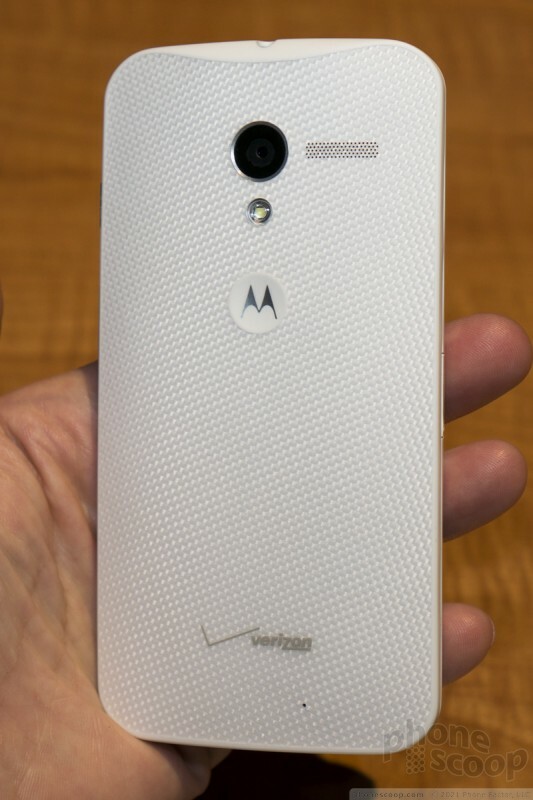 Motorola CEO Dennis Woodside said both companies sat down as soon as Google finished acquiring Motorola in May 2012 to begin work on this device. 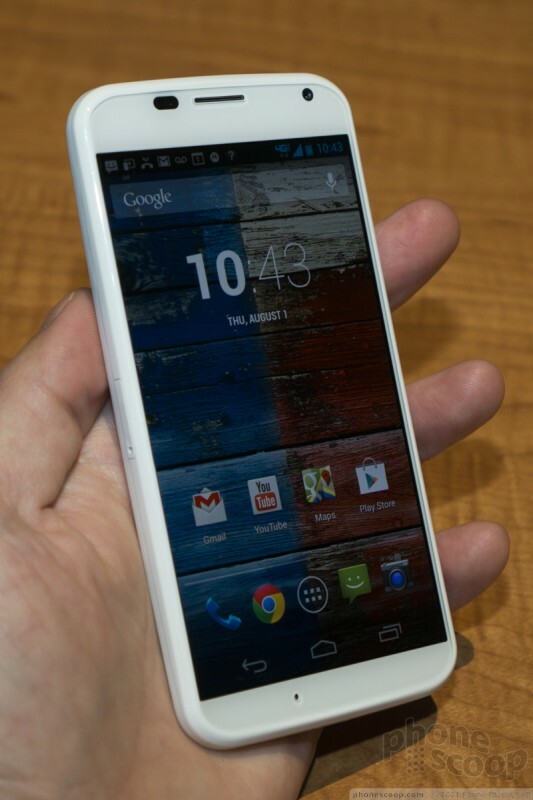 In other words, this is the first real device to come from the new Googlorola complex.Motorola's Rick Osterloh walked us through Google's thinking in crafting this new phone, and it is an interesting tale to tell. First, the size and shape. 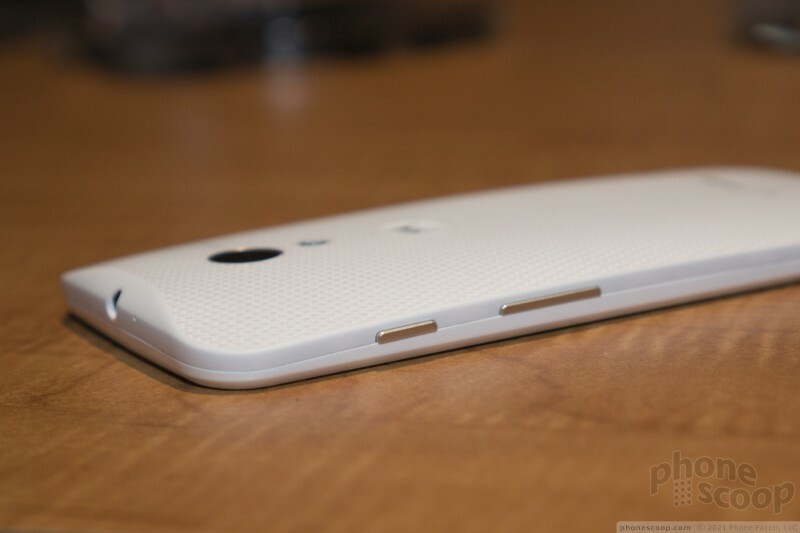 Motorola wanted to make a device that is as comfortable as possible to hold. The company measured thousands of hands to come up with what it says is the "average human hand." 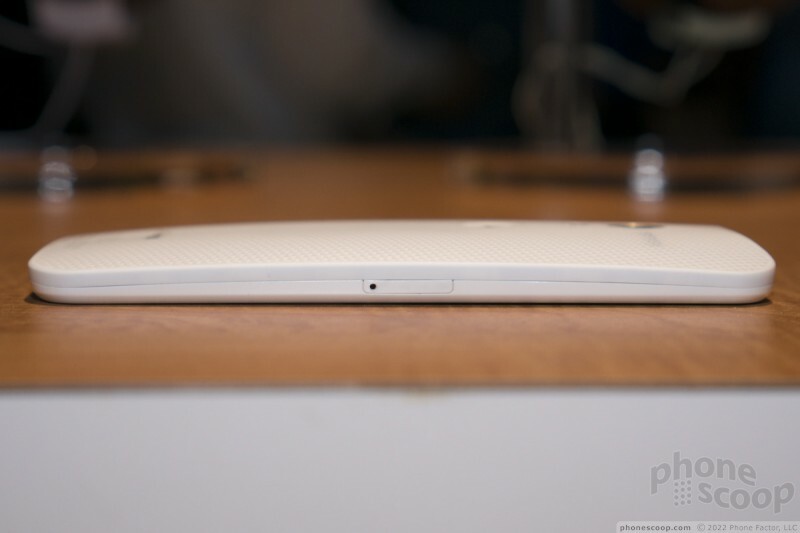 It then created the basic size of the device, which includes a curved back surface so it fits better in the hand. 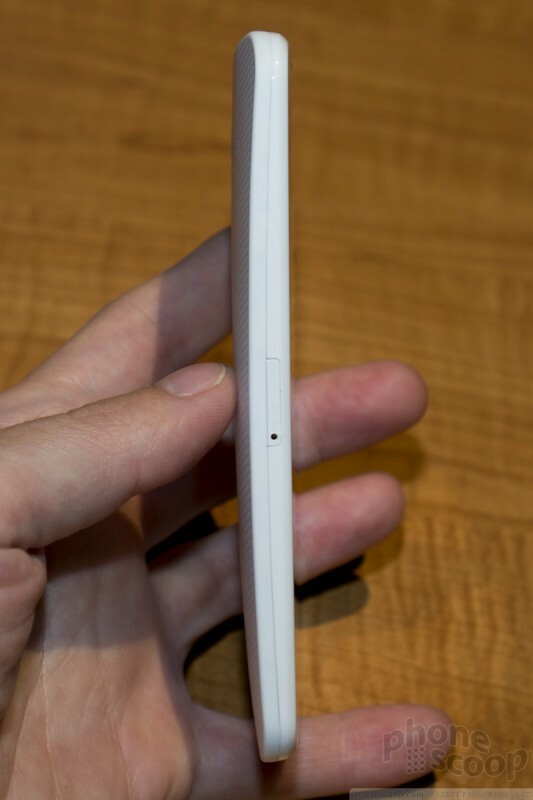 "People's hands aren't flat, so why should their phone be flat," posted Osterloh. 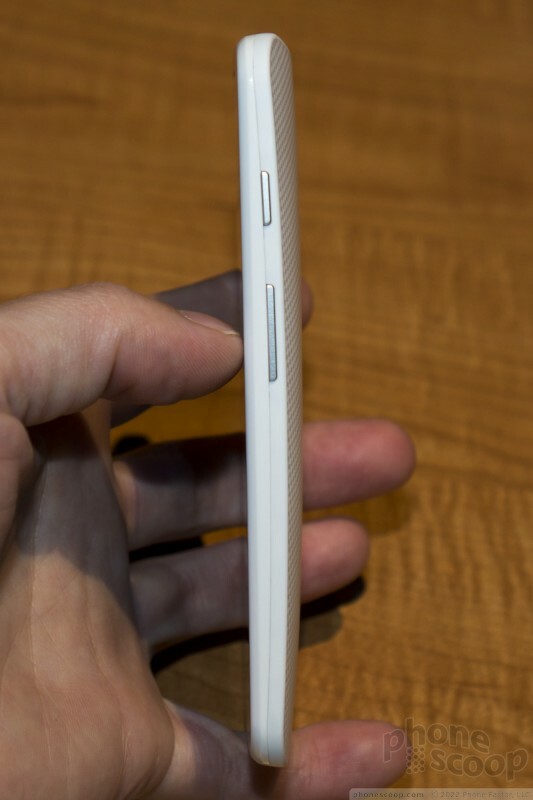 The curved surface will look familiar to anyone who's used the HTC One. It is comfortable, no doubt. 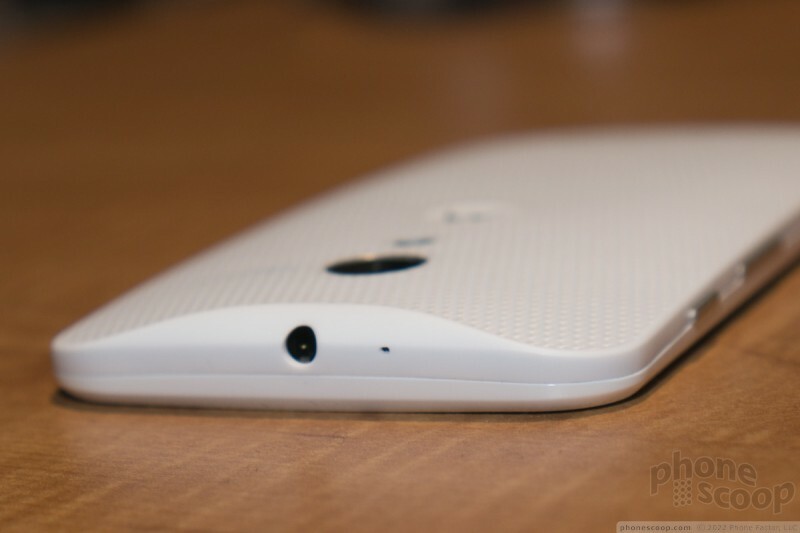 The edges are tapered, which cuts down on the width along the outer rim of the phone. 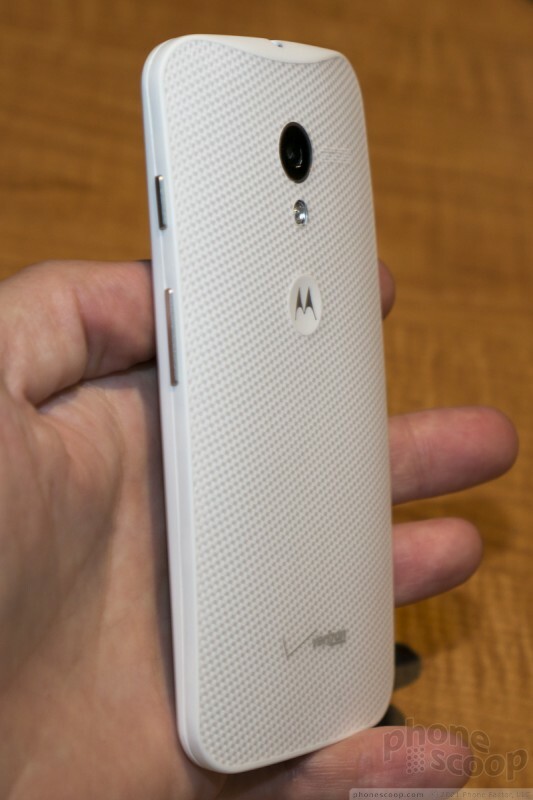 It helps that the MOTO X is also fairly thin and light, thanks in part to the materials used to build the phone. 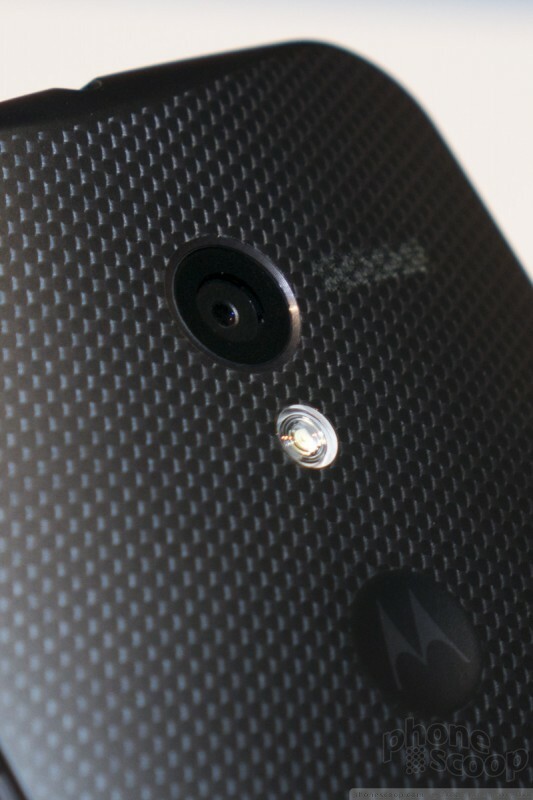 Speaking of which, Motorola says the back panel is made from a "composite." It refused to call the material "plastic." It feels like plastic to me, as does the front, which has a nice, beveled look so that there's no sharp corner where the side of the phone meets the display. Speaking of which, the screen measures 4.7-inches across the diagonal and has a disappointing 1280 x 720 pixel resolution. I was really hoping for a full HD display. 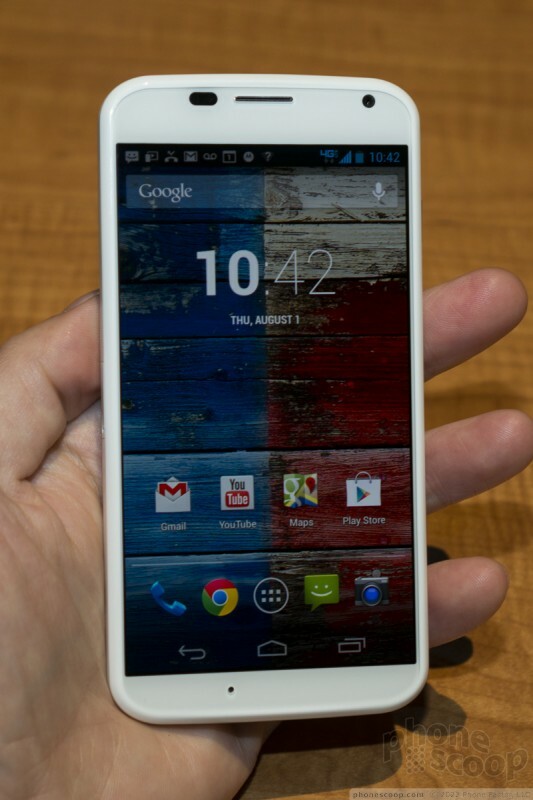 The MOTO X uses an AMOLED panel and it certainly looks good. There's nothing wrong with it, as far as my eyes are concerned, though viewing angles weren't as steep as I'd like them to be. Colors were rich and text/images still looked sharp. Some may be put-out that it's not a 1080p screen, though. Motorola said that it decided on the screen size after determining how big the entire device would be. It then stuck the biggest screen it could in the form factor it devised. 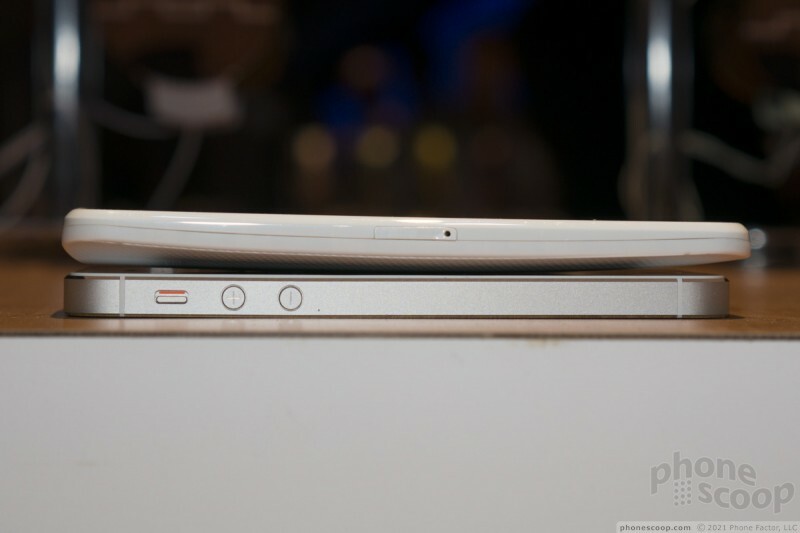 That's why it has a 4.7-inch screen rather than a 5-inch screen. The controls are laid out simply. There are no buttons along the left edge of the phone. 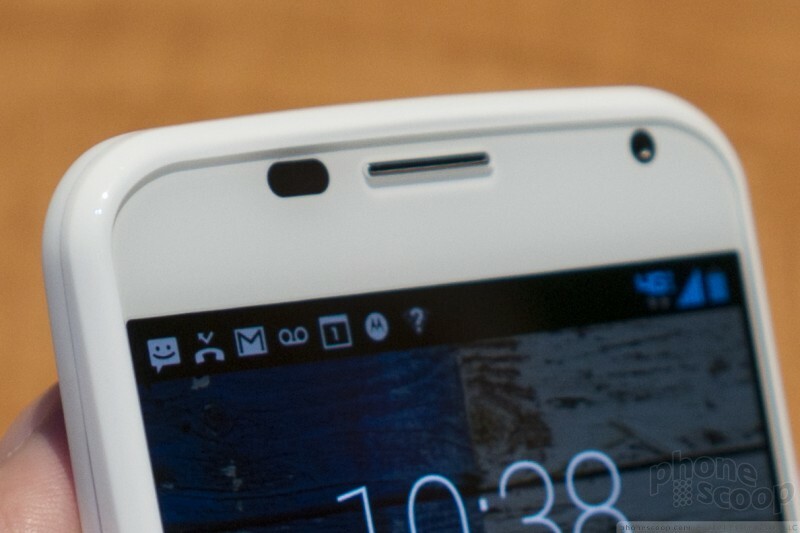 The screen lock button and volume toggle are both placed on the right edge. There are a bit thin, but they have an excellent profile and are easy to find and use. 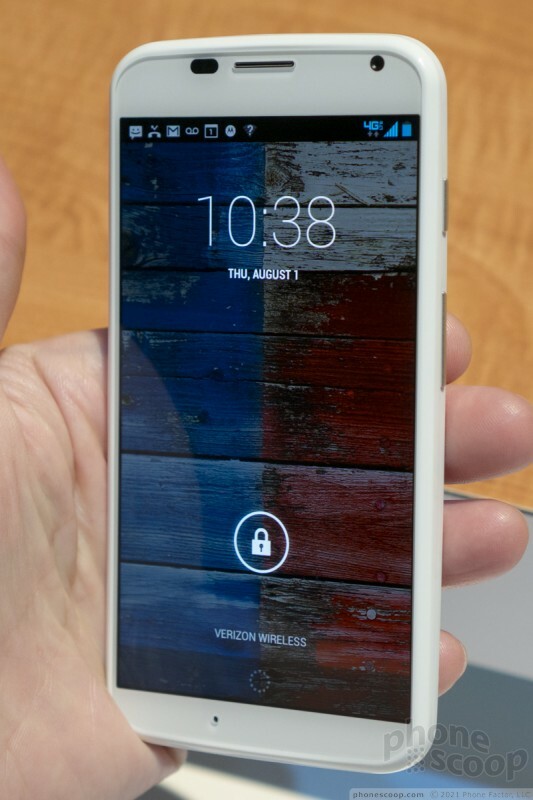 The screen lock button has great travel and feedback but the volume toggle's action could be a bit more well defined. 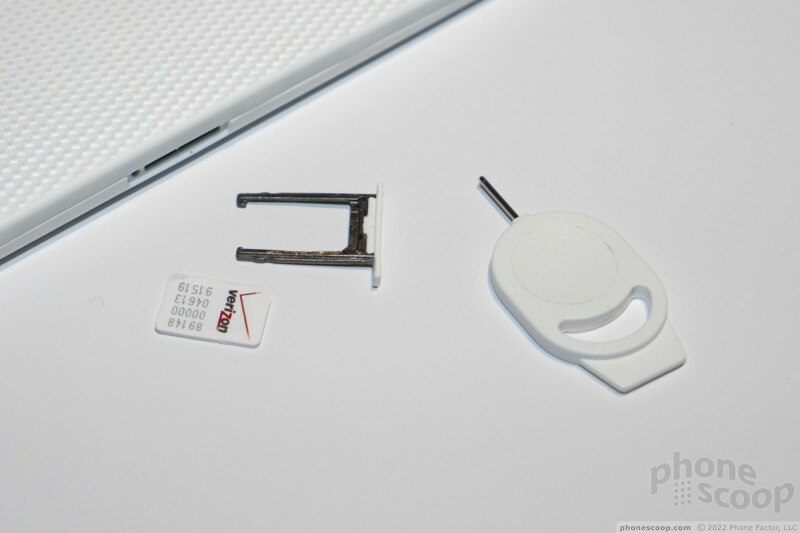 The stereo headphone jack is on the top and the microUSB port is on the bottom. 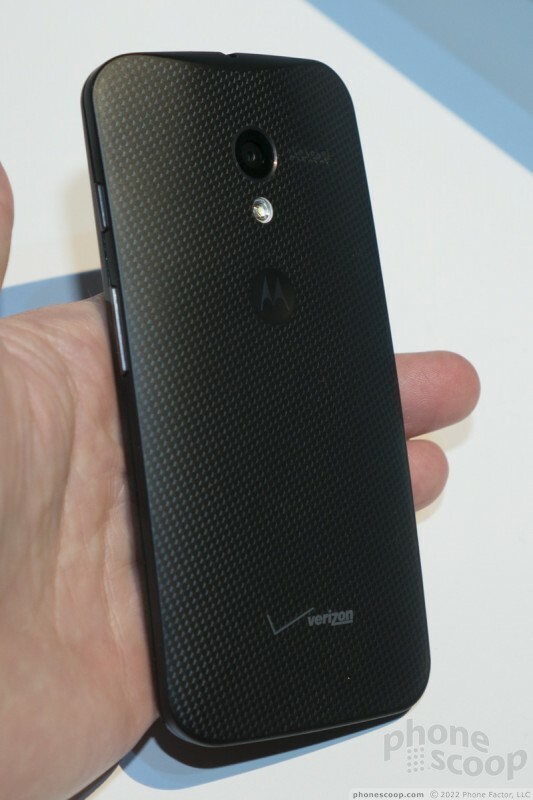 The MOTO X has a built-in 2200mAh battery. The X cannot be opened, so the battery is inaccessible. There's also no memory expansion, you're stuck with either 16GB or 32GB. Some people might be disappointed with these features, or, more accurately, the lack of these features, but it's par for the course for a smartphone these days — especially one being marketed by Google. Overall, I like the feel of the device, though it certainly does have the high-quality appeal of either the HTC One or iPhone 5. Whatever Motorola wants to call the materials, they feel like plastic, and that means they don't have a premium feel to them. They don't feel cheap, not by any stretch, but you can tell they aren't the best polycarbonates ever. 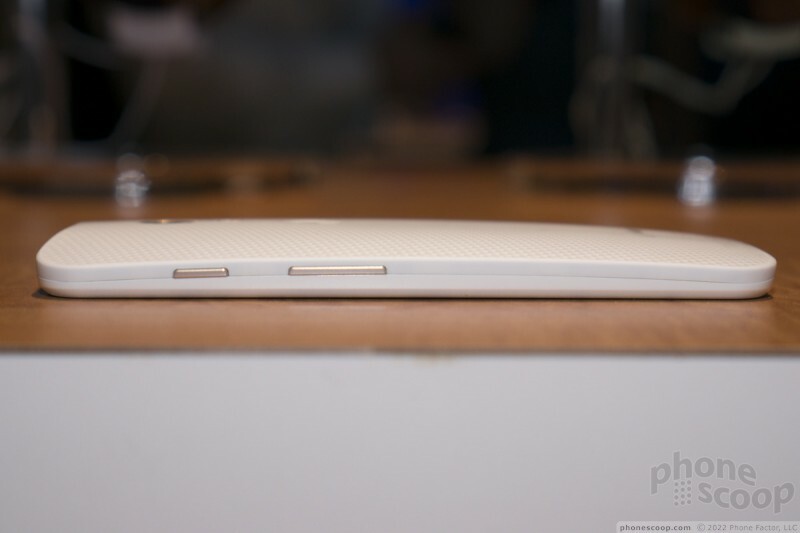 The back surface is matte, which I like, and the front is glossy. 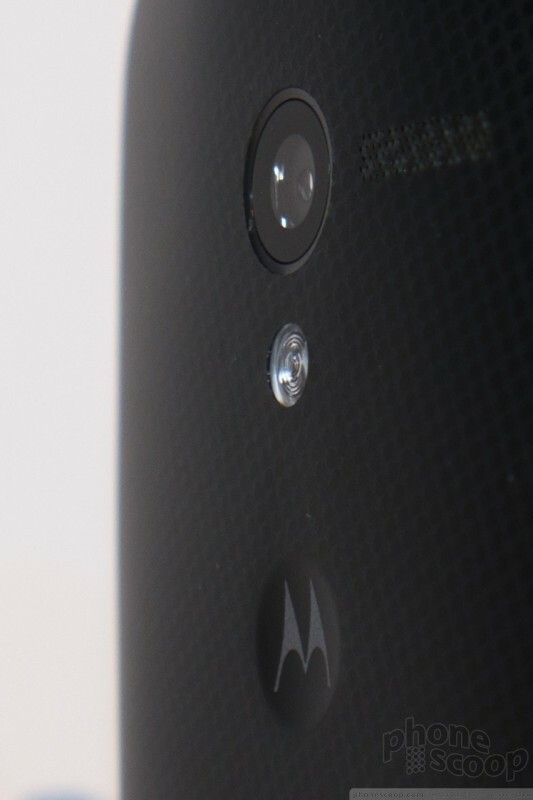 Under the skin, you'll find very middle-of-the-road specs in the MOTO X. 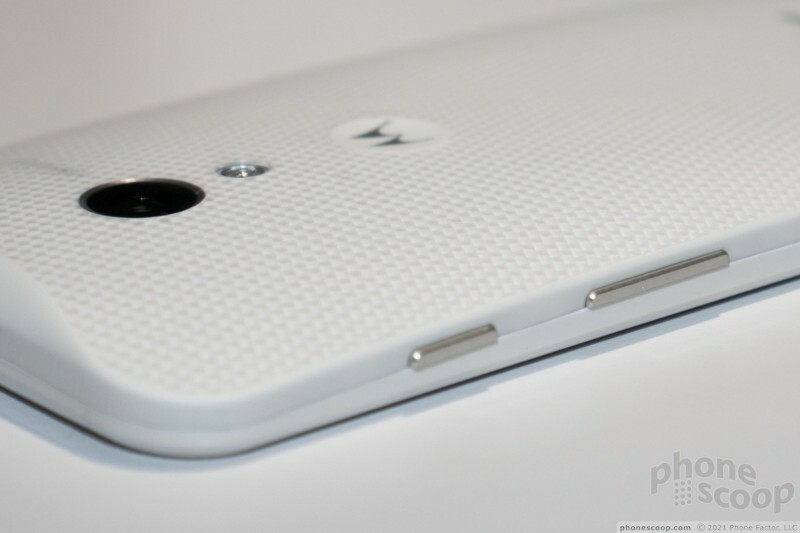 It is obvious that the X shares the bulk of its components with the recently-announced DROIDs for Verizon Wireless. It has the same 1.7GHz dual-core Qualcomm Snapdragon S4 Pro processor with the X8 architecture for extra GPU and sensor-monitoring oomph. 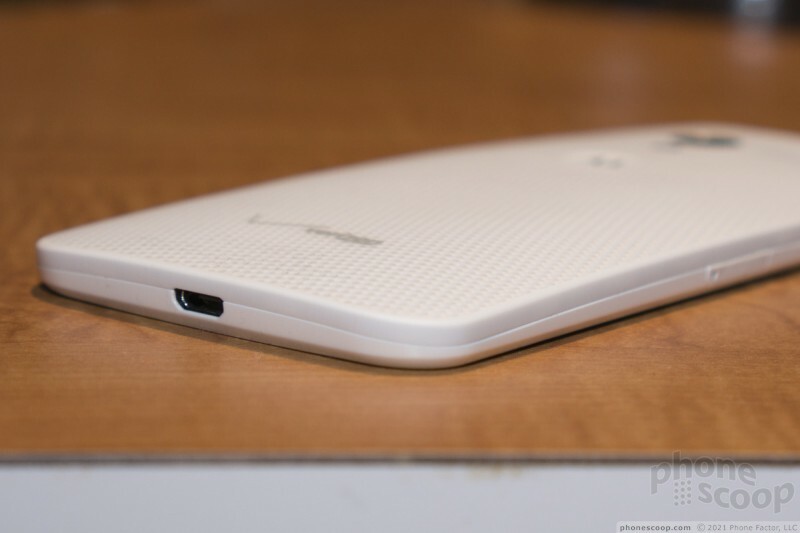 It also has the same 10-megapixel / 2-megapixel camera set-up, with LED flash and 1080p HD video capture. In all, the hardware is very good, but well short of excellent. 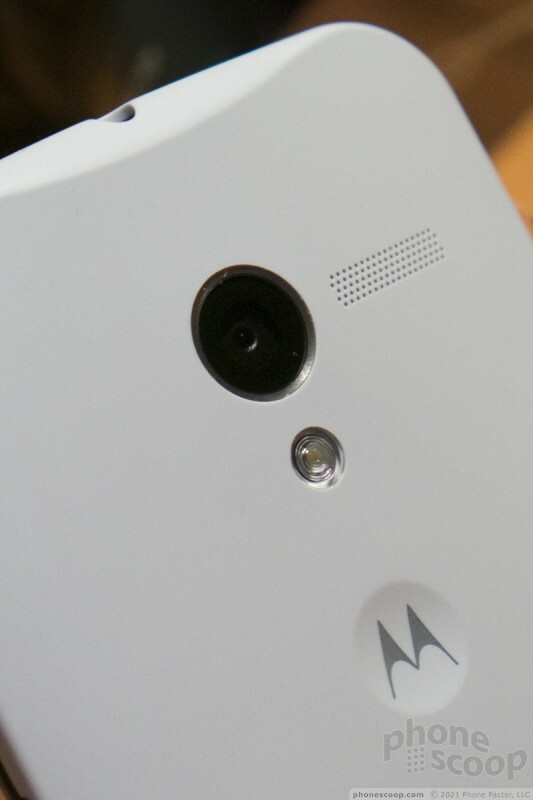 However, there's a lot more to the MOTO X than the hardware. 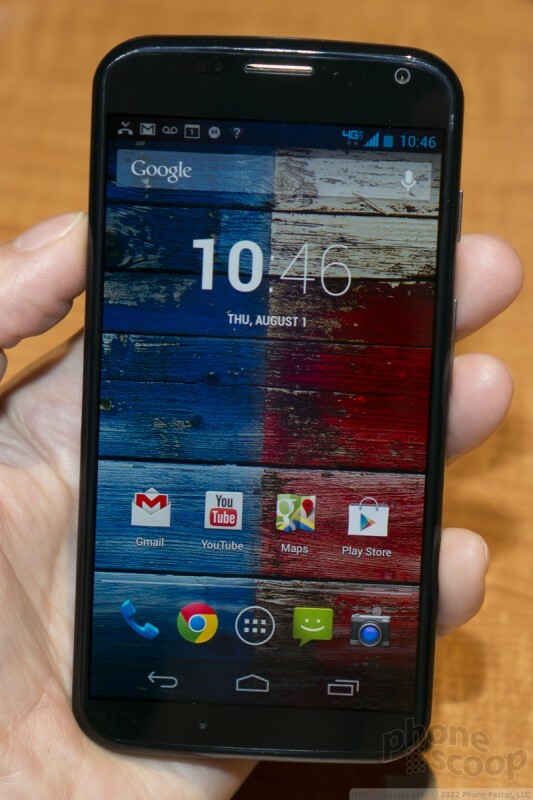 Motorola has expanded the availability of its Moto Maker tool to customers of Sprint, T-Mobile, and Verizon Wireless. 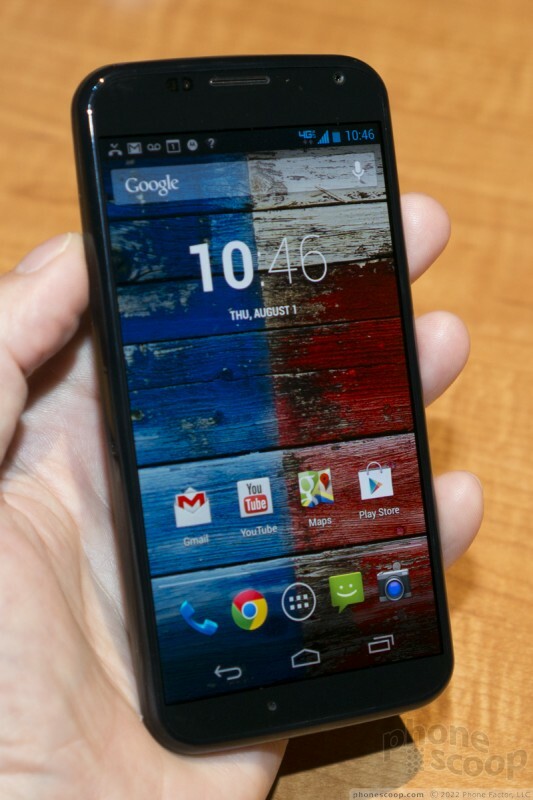 Moto Maker lets people customize a Moto X smartphone online and have it delivered to their house. I don't understand this. If I don't care about specs, I own an iPhone. If I care about personalization, I buy a case for it, which allows me to swap out the appearance of my phone far more often than my contract. And because it's a case, my penchant for bizarre colors won't effect my resale value. 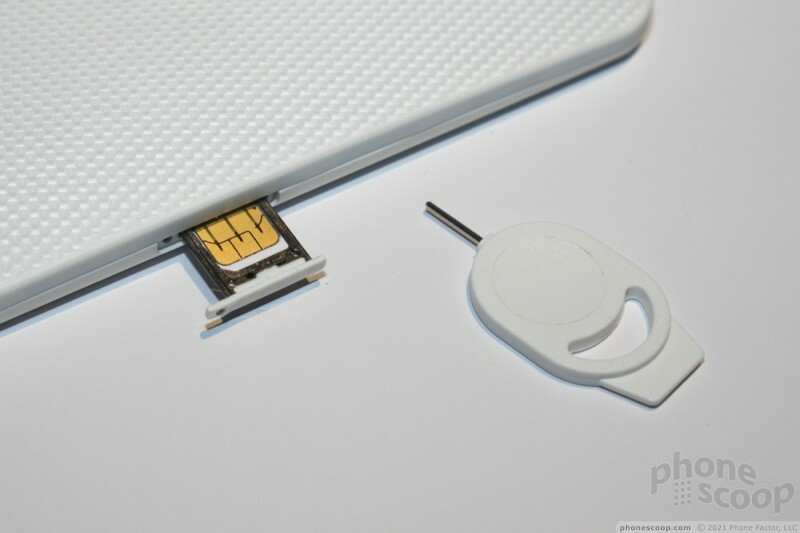 Or, to sum it up with more direct competition, the Galaxy lets you peel off the back cover and put on a new one at will. And what happens with insurance replacements? I'm going to assume it won't be covered by AT&T/asurion. Of if it is, what do they send out as a replacement? Your green and blue with purple phone or the standard black? I refuse to purchase a modern smartphone that doesn't have a microSD card slot. I've already almost maxed out my current 32Gb microSD card and need to buy a 64Gb one. And with phones lacking a microSD slot, you have to share the memory with applications and system resources. And Cloud Storage isn't a viable alternative since a fast network connection isn't always available. Plus, since most carriers no longer have unlimited data plans, you would have to PAY to access YOUR OWN content (pictures, videos, music, documents) via the Cloud. Great for the Carriers. Not so great for the customers. I wish more people would realize this. It seems many in these forums think with their lower extremities. Where is it an advantage to a consumer to spend 700-900 dollars on a phone that you can't service or replace the weakest link? 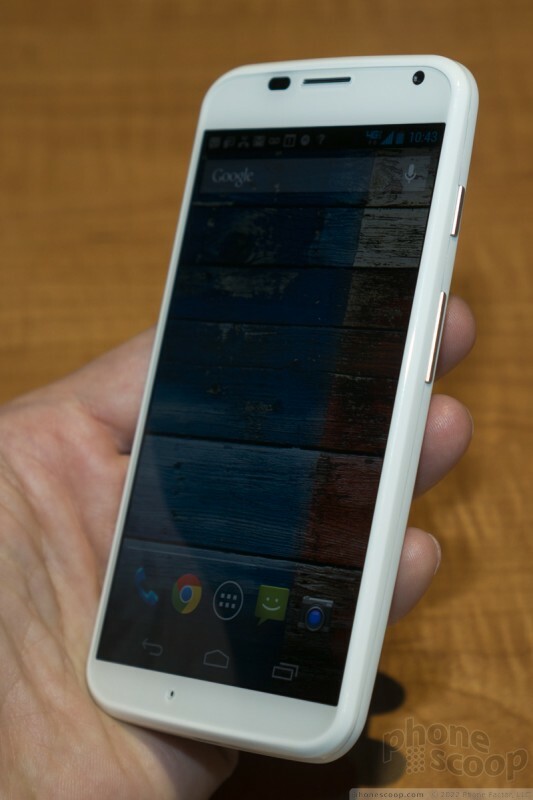 I was surprised at the specs, which are nearly identical to the N4 (which has been out for almost a year). Was hoping this might be an Android to get me back into Androids. Disappointment. Definitely don't feel excited about this. Looks nice, though. An Android to get you back into Androids. 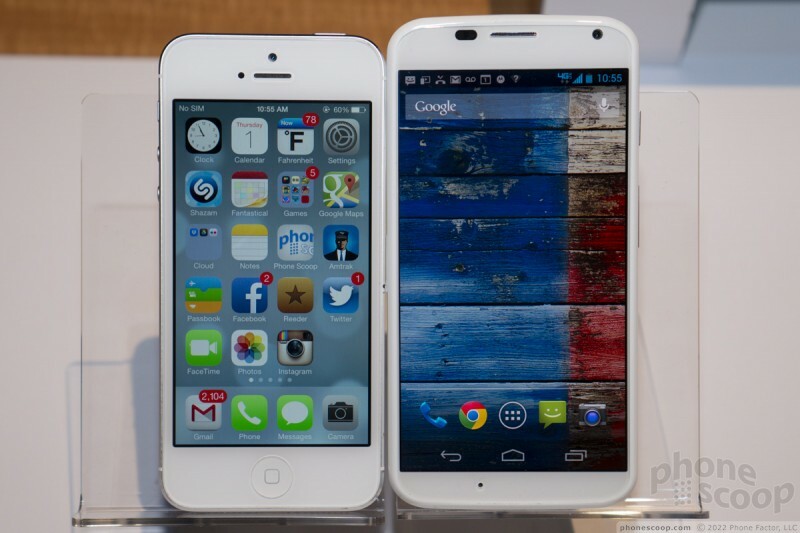 Its called the HTC ONE and Samsung Galaxy S4. as in lower price. For all the comments Dennis Woodside made about this huge price chasm between feature phones and smart phones and how that chasm wasn't going to last, Googorola just delivered a phone par for the (price) course. This phone brings nothing to the table but hype. It is disappointing and patronizing all at the same time. And its ironic that a Googlized Motorola suddenly thinks it is Apple, i.e., telling its customers what they want and offering less features for more money. want excitement? wait for Samsung! i'll wait for Samsung to bring in the good stuffs! they always put new features in their newest phones! Was it just me, or did other people just feel the word "ugly" appear in their heads within the first second of looking at this phone? I dont know - this phone just.. doesn't look right. There is something about it that just makes it completley unappealing to me. 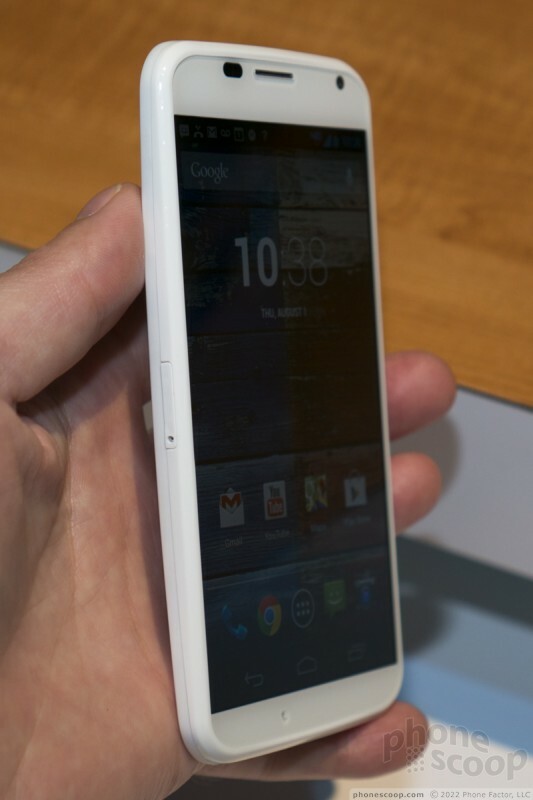 Anybody else think this phone is just plain ugly? I actually like it, my biggest complaint is non-removable battery. I like the 720p display simple because battery life and all my tvs are either 720p or lower anyway and shows and stuff still looks great on them. I like the customization option to.